There is nothing worse than when your speaker dies because of a lack of energy. You’re jamming out to your favorite tunes and then the music stops, killing the moment. Luckily, the team at SolarBox has answered our prayers and built a speaker with a battery life up to 60 hours! In addition to a large battery the SolarBox comes with a built-in solar panel. Allowing you to play music literally wherever and whenever you want. With that being said the SolarBox is currently seeking funding for their product on Indiegogo. We recommend visiting their page and donating if you like the product. As we mentioned above the SolarBox has an impressive battery life of 60 hours. SolarBox is able to accomplish this by using a very large Lithium Polymer internal battery. This battery has a capacity of 5000 mAh, which is a lot compared to other solar speakers on the market. This battery is so large that you can play music for one hour each day and the speaker will last up to 2 months without running out of energy. This amount of play time is simply unmatched by other portable speakers. Making the SolarBox and ideal option when looking for premium speakers. In addition to a great battery life the SolarBox also comes with a built-in solar panel. This solar panel is highly efficient and is made out of monocrystalline cells. These types of cells are the most efficient on the market and generate a lot of energy with less surface space. 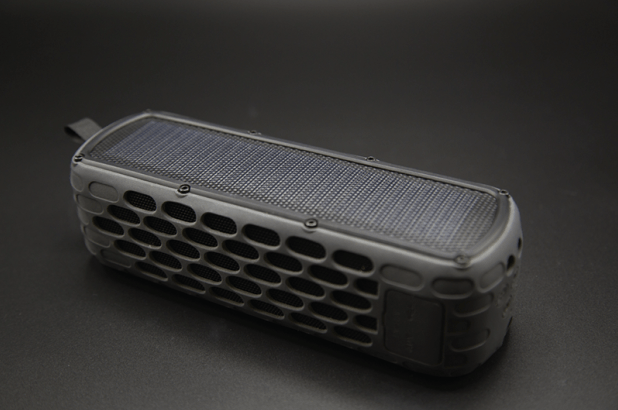 In fact, the solar panel is so powerful that it will keep the speaker charged at all times. Just 10 minutes in the sun will let you play music for 30 minutes. So if you’re out in the sun a lot then you will literally never run out of battery life. Freeing yourself from outlets and while enjoying quality music on your adventures. The SolarBox can play music through Bluetooth or AUX cord. The bluetooth works on multiple systems including Android, IOS, and Windows. In addition the SolarBox is the first portable speaker with high-fidelity sound. Meaning it plays a frequency between 100 Hz-18,000 Hz with a sound distortion rate lower than 0.1%. 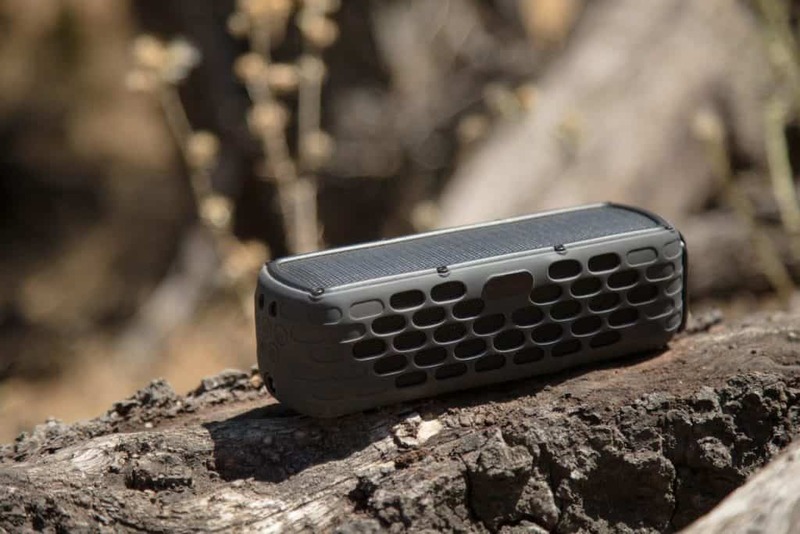 To make the sound quality even better the SolarBox is built with ultra accurate speaker locations, expanded sound, and consistent high quality Bluetooth transmission. Making the sound quality of the speaker truly amazing and perfect for any outdoor occasions. Not only can the SolarBox create beautiful music, buts it’s also super functional. 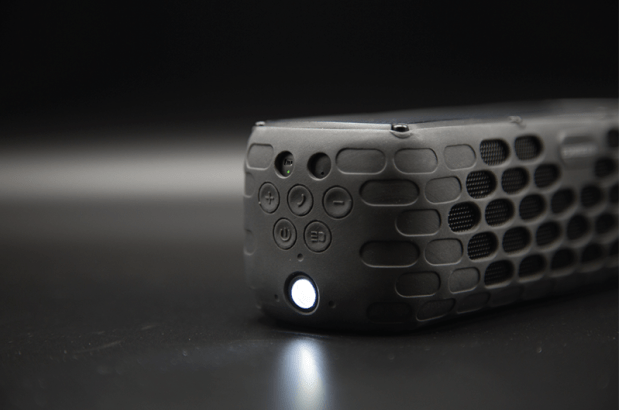 The speaker comes with a built-in LED light.The light comes with multiple modes such as illuminating mode, SOS emergency mode and wolf protection mode. These multiple modes make it an ideal companion for any camping or backpacking trip. In addition to this you can also take calls through the speaker. All you need to do is press one button to answer or end the call. The SolarBox also uses a built-in CVC noise-canceling microphone for the best call quality possible. So no matter where you are you can take any important phone call. The last impressive thing about this speaker is its durable design. 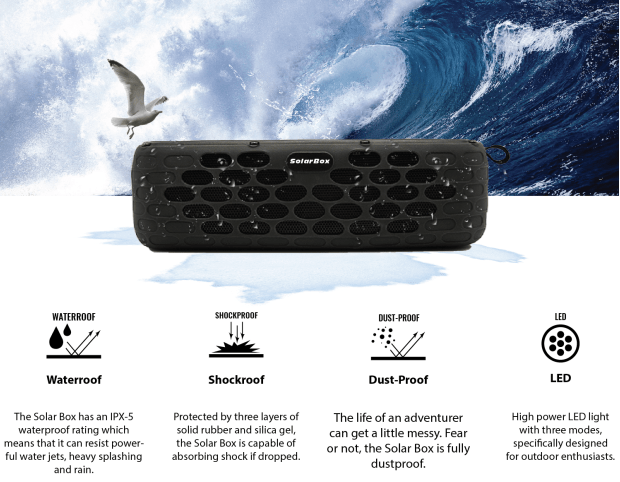 The speaker is rated waterproof IPX-5, which means it can resist powerful water jets, heavy splashing, and rain. 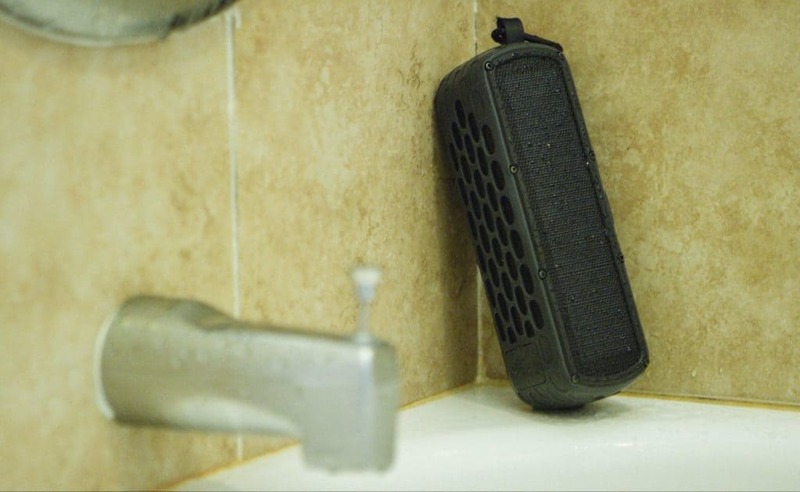 While there are other speakers with better waterproof ratings, it’s still impressive and a great feature. The SolarBox is also shockproof. Its protected by three layers of solid rubber and silica gel. Allowing the device to absorb most shocks when dropped. To complement this the speaker is also fully dust-proof. Making it ideal when using it at the beach, river, or the desert. In the end the SolarBox solar speaker is a great option when looking for a premium solar speaker. It has an impressive battery life and is extremely durable. 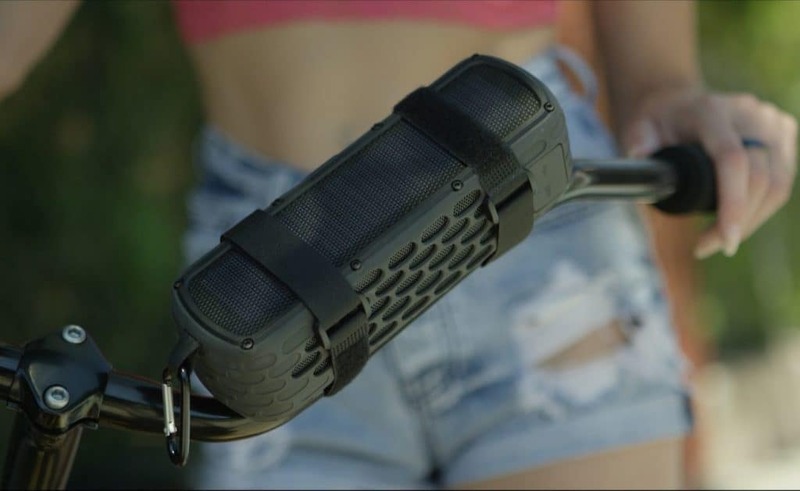 In addition the built-in solar panel allows you to use the speaker wherever you want without running out of juice. The only negative thing about the SolarBox is that it doesn’t come with a USB port to charge your devices. A lot of solar speaker on the market have this feature so its sad to see they didn’t include it on this device. With that being said the SolarBox is currently being funded on Indiegogo. We recommend donating to their campaign if you like the new SolarBox product and want to get your hands on it. You can currently get the early bird option and purchase the device for $59. Which is 54% off its market price.